In the morning after he had said his prayers, he sat himself down to his work; when, to his great wonder, there stood the shoes all ready made, upon the table. If you recall the old fairy tale of the shoemaker and the elves, you know that the shoemaker was not incompetent, dishonest, or lazy. He was a good man and a hard worker, but in this world goodness and hard work do not always result in financial success. This is why the elves stepped in from that other world and aided the shoemaker. The shoemaker felt he had done nothing to warrant the aid of the elves, but of course he had done something. 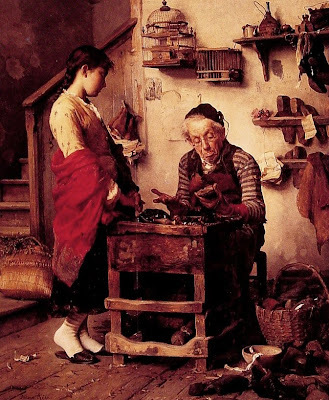 Simply by being the good and true shoemaker, he placed himself in a position to be the recipient of divine aid. And therein lies the problem with the modern world: there are no more cobblers or cobbler’s shops; our shoes are made in factories by anonymous workers, who are legion. How can we be the recipients of divine aid if we have not ordered our lives in accord with His will, or – to put it another way – we cannot live in a soul-dead, Wal-Mart world and expect to hear the sound of that great ‘amen.’ List all the sins of the old Europeans, and they will be more numerous than the sands of the desert. However, having listed the sins of the older Europeans, let it then be said that they, and they alone, were the good cobblers who, through their labor of love, elicited a divine blessing from the God of love. Against the world of the good shoemakers is the world of the liberals. Lincoln spoke for all the liberals throughout the world in his Gettysburg address. Could a world conceived by Satan and dedicated to the eradication of Christianity long endure? Yes, it has long endured. Much too long. It has endured because the liberals have invoked Satan as their guardian angel. And in saying that they have called on Satan, I do not mean to suggest that liberals en masse have formally called on Satan in satanic rites. But they have, in their hearts, rejected the ancient faith of the Europeans who believed that Christ, the Son of God, was at war with Satan, the fallen angel who prowls about the world seeking the ruin of souls. The liberals’ rejection of the belief that human beings are in essence spiritual beings, not materials beings, does not change reality. This world and its inhabitants are animated by the spirit. If you reject Christ as true God and true Man, you will belong to Satan and adhere to satanic principles whether you believe in Satan or not. Satan, unlike Christ, does not want to be loved by mankind; he merely wants mankind to serve him in his war against God. Since man is a spiritual creature, if he is not animated by Christ the vacuum in his soul will be filled by Satan. In a very real sense the liberals are possessed; they are the devils of which Dostoevsky wrote. Every single satanic edifice of liberaldom begins as an honest trifle and then turns into a stone pillar of Satanism to stand in complete contrast to every principle of Christendom. Halfway-house Christians tell us that race-mixing, feminism, and equalitarian democracy all stem from the Christian belief that all men are created by God. But does that mean we should make no distinctions between barbarism and Christianity, worship black men, allow women to kill their babies, and “divert, crack, rend and deracinate” every ancient tradition of the Christian European? Of course it doesn’t. And no Christian European with any blood left in him would be deceived by Satan’s honest trifles no matter how well they were disguised. There’s the rub: when the European exchanged his blood faith for a philosophical system, he lost the ability to recognize the difference between Satan’s clever trifles and the real things of consequence that flow from a heartfelt faith in the God-Man. The vast majority of white Europeans have gone over, body and soul, to Satan’s kingdom on earth. They belong to liberaldom and will never leave it. What is left is only a small minority, perhaps too small to be called even a minority, of blood, throne and altar Europeans who oppose the liberals. But there is a sizable minority of white Europeans who are neither fish nor fowl. They want the benefits that come from a Christ-centered culture, but they also want to be stroked, petted, and financially rewarded by the powers that be. The halfway-house Christian who deplores legalized abortion but eschews any opposition to abortion that is violent or undemocratic belongs in the no-man’s land between liberaldom and Christendom, and likewise, the Bob Jones University Christians, who want the freedom to preach the parts of the Gospel they like but are willing to tolerate race-mixing in order to appease the liberals. I personally have never known a halfway-house Christian who has joined the ranks of the ancient Europeans, but I have known many who have joined the liberals. The European who still clings to the blood faith of his ancestors seems doomed to a very lonely existence, but is the last European really as lonely as the liberal and the halfway-house Christian? Granted, the European is lonelier as regards the day-to-day comforts which the liberals and halfway-house Christians enjoy. There are no social gatherings at which the European can talk freely. There are no organizations clamoring for his input, but man is a creature of the depths whether the liberals and the halfway-house Christians acknowledge it or not. The liberal stares at the ocean and declares all that exists is on the surface. The halfway-house Christian says there are some interesting sea creatures to be found some two feet below the surface. But it is only the European who knows that the ocean’s greatest mysteries are in its depths, the depths which the liberal says do not exist and the halfway-house Christian claims to know all about, even though he has never gone more than two feet below the surface. Lonely? Yes, the European is lonely in those moments when, surrounded by liberals who deny the existence of a spiritual dimension to life and by halfway-house Christians devoid of vision, he wonders if there are no depths to life. Then he remembers: he has plunged the depths; below the surface of life there is someone who comforts the sick at heart and eases the pain of loneliness. The liberal who has sought comfort from the devil, and the halfway-house Christian who seeks comfort from the liberal will ultimately be betrayed in deepest consequence. We are back with the old shoemaker. The miracle of the shoes occurred because the shoemaker didn’t regard the appearance of the shoes as something extraordinary. Hadn’t the God he believed in sent His only Son to die on the cross, in the ultimate act of charity? Why should a lesser act of charity surprise the shoemaker who believed in the greatest of all acts of charity? The shoemaker, because he lived in Christian Europe, viewed the spiritual dimension of life as a concrete, tangible realty, just as we, in the post-Christian era, view the existence of the North American continent as a concrete, tangible reality. The shoemaker’s Europe was constructed to let the light of His world illuminate the spiritual dimensions of this world. The veil of the material world was pulled aside and the European saw his beginning and his end. In contrast, liberaldom was built to shut out the light. With a satanic, maniacal consistency, every aspect of the older European culture has been deracinated and condemned. How is it possible for a European to believe that he can come to some amicable working arrangement with the rulers of liberaldom? “You can stay godless and liberal, but please refrain from abortion.” “You may worship the black man, but don’t force us to integrate.” Liberals will never compromise on one single point of their satanic agenda, and they will never allow one single Christian European to be left unmolested and unregulated in their satanic kingdom. One thing is crystal clear. Liberaldom was built and is sustained by Satan. And Satan will never be defeated by any force that comes from within the system which he, Satan, created. “Conservative” think tanks and “grass roots” movements are all part of Satan’s kingdom. He not only permits but encourages everyone to participate in the democratic process, because there is nothing within that closed system that does not ultimately serve the needs of Satan. It seems like the last post for those of us who side with the shoemakers of old Europe. But it isn’t the last post if we step outside liberaldom and attack the liberals right in the middle of their premature victory parties. “Among them but not of them.” From a strictly materialist standpoint, we can’t be in liberaldom and launch an attack from outside of liberaldom, but spiritually we do stand outside of liberaldom. And the spirit above the dust He revealed to us is the only reality. From that metaphysically solid ground we can and will launch our attack. Every war the European has ever fought was just a minor skirmish compared to the coming battle with liberaldom. Hell is indeed empty and all the devils are here to fight against the last Europeans. Sword, gun, or pen; each man will use the weapon he was born to use. The readiness is all: the Europeans still connected to the shoemaker’s Europe are ready to turn and face the enemy.